Welcome to Stamp It Group Valentines Day Blog Hop. 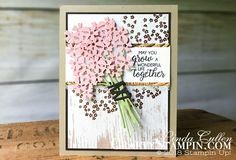 We are all using current Stampin Up Product. I’m Linda Cullen from Massachusetts, USA and you are visiting my blog Crafty Stampin’. At the bottom of my post, you will find a list of all the participating blog hoppers so you can move along from blog to blog and see all the fantastic projects. Make sure to leave a comment on each blog with the hashtag #stampitcontest to be entered to win the Lots of Happy Card Kit! For today’s Spring Fling Blog Hop, I decided to make a spring sampler page. I’ve always wanted to make a sampler page and I have several Pinterest boards dedicated to samplers but I’ve just never made one for myself. I decided to try to create one of all the images that make me think of spring: Bugs, birds, outdoor activities, April showers and May flowers. I use soooo many different stamp sets and thinlits, but I think it was worth it!! Start with at 12 x 12 Whisper White panel that I cut to 9″x9″ to fit the frame I had. The hardest part of this entire project was figuring out what size to make the 9 square panels and lining them up perfectly. The Crumb Cake squares were cut with the 2nd largest square from the Layering Square Framelits Dies, and the Whisper White were cut with the 3rd largest. I tried to stay mostly in the Subtles color family for the color palette. For the first square uses the hot balloons from the Lift Me Up stamp set and the matching Up & Away Thinlits. The hot air balloons are Calypso Coral & Pool Party. I created trees with the trunk from the Tree Builder Punch in Chocolate Chip and the “leaves” are from the Swirly Scribbles Thinlits Dies in Lemon Lime Twist and So Saffron to depict the soft colors of early spring trees. Nothing like a spring bike ride with the Bide Ride Stamp set and matching Build a Bide Framelits Dies. The bike is Wisteria Wonder and Basic Gray the flower basket is Crumb Cake and Chocolate Chip and the flowers are Memento Tuxedo Black, Flirty Flamingo, and Wild Wasabi. My spring momma bird and chick are from the Best Birds Stamp Set and matching Birds & Blooms Thinlits Dies. The brand is colored with Stampin Write Markers in Chocolate Chip & Wild Wasabi. Momma & baby bird are cut from Soft Sky card stock with Marina Mist, Whisper White and Chocolate Chip ink added with Sponge Daubers for detail. The future so bright, I gotta wear shades. The sunglasses are from the Pocketful of Sunshine Stamp Set are stamped in Memento Tuxedo Black Ink on Marina Mist cardstock and cut with the matching Pocket Framelits Dies. The sun is part of the Sale-a-bration Amazing You Stamp Set in So Saffron. April Showers … The umbrella is from the Umbrella Weather Framelits Dies in Calypso Coral and Soft Suede card stock. The raindrops come from the matching Weather Together Stamp Set. …bring May Flowers. The flowers are from the Bouquet Bunch Framelits Dies in Calypso Coral and Lemon Lime Twist cardstock. And with Flowers comes the bug to pollinate. The background is from the Birthday Blossoms Stamp Set in Wisteria Wonder. The dragonfly is stamped in Whisper White and Vellum cardstock in Memento Tuxedo Black ink and embossed with Clear Embossing Powder on the Vellum Cardstock then both images are cut with the matching Detailed Dragonfly Thinlits Dies and attach together with Mini Stampin Dimensionals, and then attach to the panel with Mini Glue Dots. The final panel is a picnic basket from the Picnic Basket Builder Framelits Dies in Soft Suede with the wine bottle from the matching Picnic With You Stamp Set in So Saffron. The grass is also from the Picnic Basket Builder in Lemon Lime Twist. My “large” strawberries are from the Fruit Basket Stamp Set in Real Red and Lemon Lime Twist and punch out with the matching strawberry punch from the Itty Bitty Fruit Punch Pack. I love how the sampler page came together and might not my last one. What a gorgeous spring project!! That is a lot of work, but it is gorgeous! Simply amazing Linda. Love all the detail you put into each element. Linda, love it. I always enjoy your tutorials. Thank you. #stampitcontest – Wowzers, that is an awesome Spring Sampler, you put so much work in to it. Great Job !! #stampitcontest Just Love Your Cards and Projects. Thank You and Great Job. #stampitcontest I love your cards. Your sampler page is amazing, Linda! Thank you for sharing! #stampitcontest. You never disappoint! Awesome card! You have given me some ideas on how to use some of my framelit dies! What a neat project! Some day I will get brave enough to attempt a sampler. I Love your window sampler. That bike and basket of strawberries are my favorite, simply beautiful. Thanks for sharing. What a beautiful ,over the top project!!! You really knocked this one out of the park!!! Cool project turned out great! LOVE your project Linda, and awesome blog hop! Absolutely looks like spring to me! Great project. This card is amazing. You really put a lot of work into it. But worth every minute. This is super adorable, but we are talking about you. Thanks for always sharing your talent. And being beautiful inside and out. Loving the dragonfly. Cute idea. Love your sampler page! Very fun project! #stampitcontest Wow! 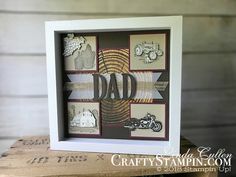 You are SO creative, putting all these different elements to make a spring shadow box. I lone it!!! #stampitcontest What a truly awesome piece of art!